Your vegetable garden fruit trees and other flowering plants will be vastly improved. They will flourish from the extra pollination. Imagine producing your own 'Gippsland' honey ... It's delicious! If you are re-vegetating your property by planting native plants a few hives will enhance the result. Current evidence is that a few honey bee hives won't adversely impact on Gippsland's native bee population. By keeping a beehive or two you will be helping the environment by assisting to address the worldwide decline in bees. In recent years a phenomenon called Colony Collapse Disorder (CCD) has devastated hives in Europe, the Americas and Asia. The worldwide decline in bee populations due to the destruction of native habitat, increased urbanization, use of pesticides and devastation by parasitic mites (varroa) and CCD is a worrying trend. Australia, so far, has been spared some of this devastation but it is only a matter of time before our borders are breached. 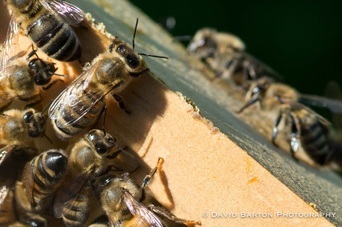 Amateur Beekeepers all over the country have become a vital link in the early detection of CCD and varroa mite as they regularly check their hives and monitor the health and well being of their bees. Responsible beekeepers care about their bees and are aware of the need for rapid and accurate reporting of any 'reportable' conditions within their hives. The agricultural community is counting on this diligence for the safe and healthy continuance of all agricultural industries.